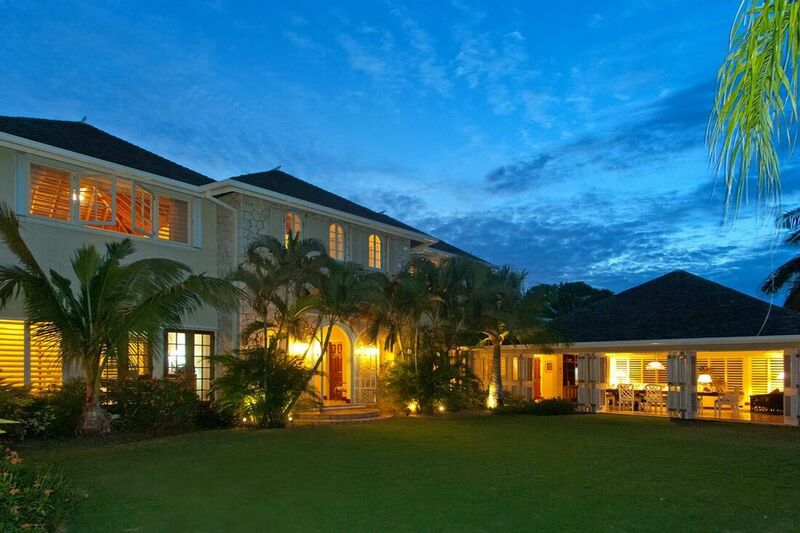 3 Bedroom Luxury Villa -The picture-perfect Jus’ Paradise Golf Villa is very appropriately named! 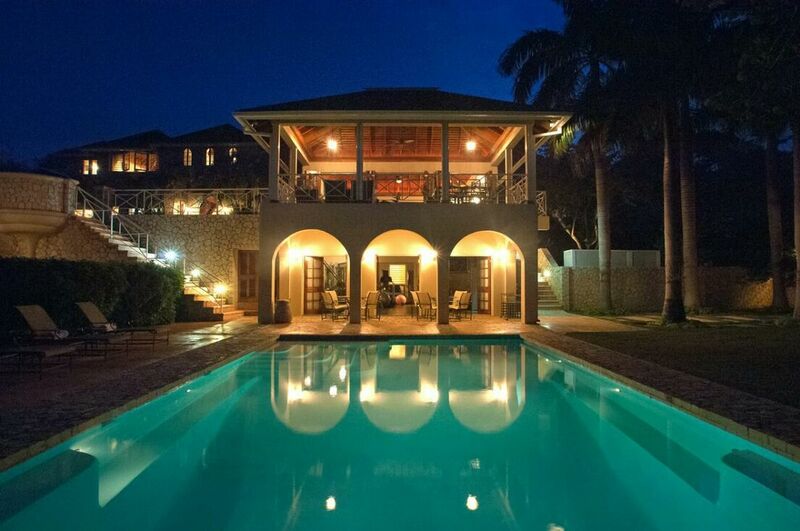 Located in the prestigious and gated Rose Hall residential complex, it is one of the very fine luxury villas Jamaica in the compound. 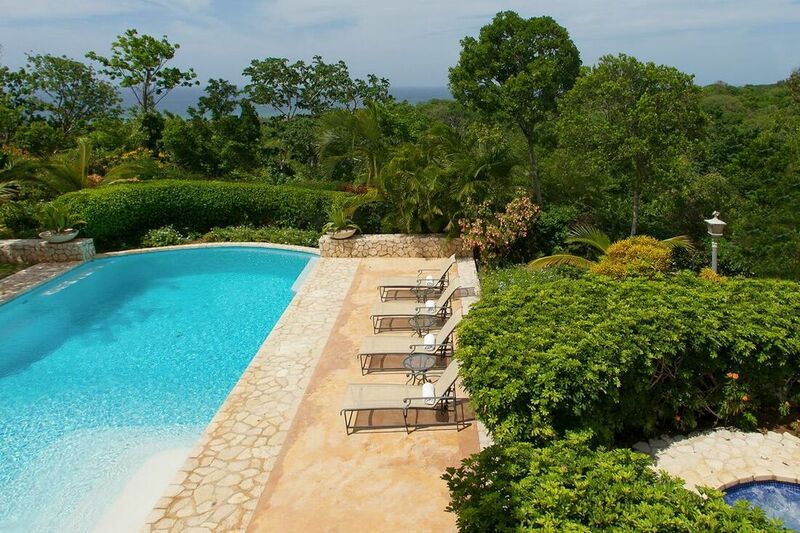 Nestled on the lush hills of Rose Hall, the 3-bedroom villa is perfect for golf enthusiasts. 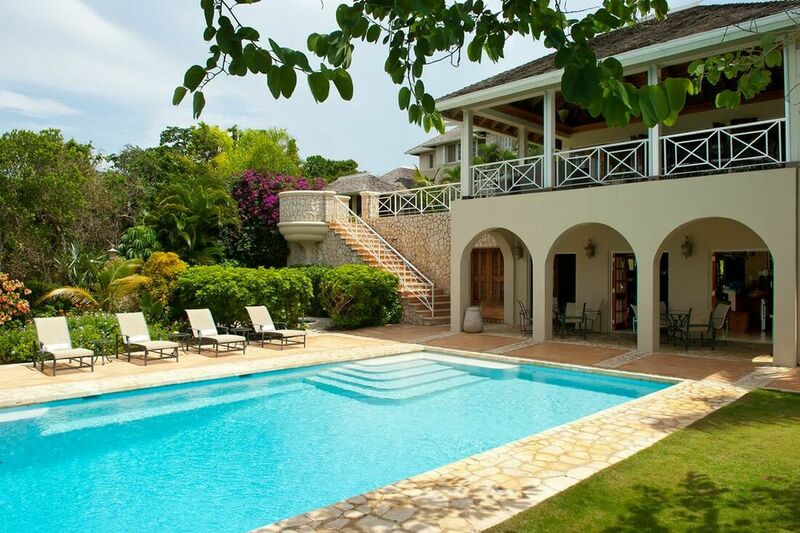 The Jamaica villa lies in the midst of two famous golf courses, Cinnamon Hill and White Witch. Half Moon is at a five minutes’ drive, while Montego Bay Convention Center is four minutes downhill. 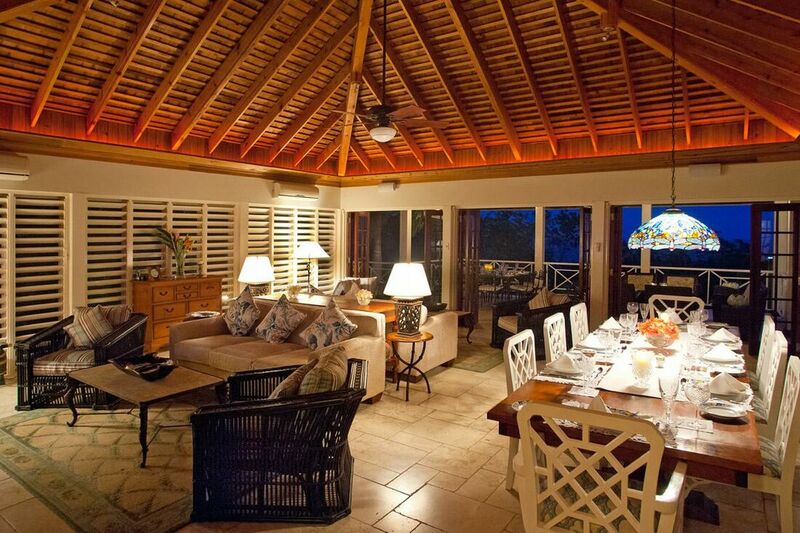 Jus’ Paradise Golf Villa has an impressive architectural design based on three floor levels. The main level lawn has steps that lead to the lower level which houses the soft lawns, BBQ and the lovely swimming pool surrounded by lush gardens. The 20’ by 35’ long, sun-covered symmetrical saltwater pool is child-friendly due to being chlorine free. 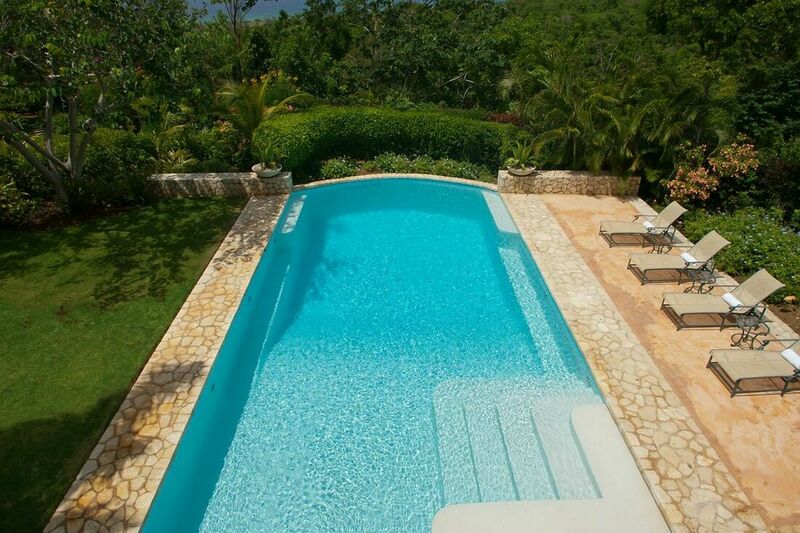 The pool patio has several very comfortable lounges and is surrounded by lush, beautifully landscaped gardens. 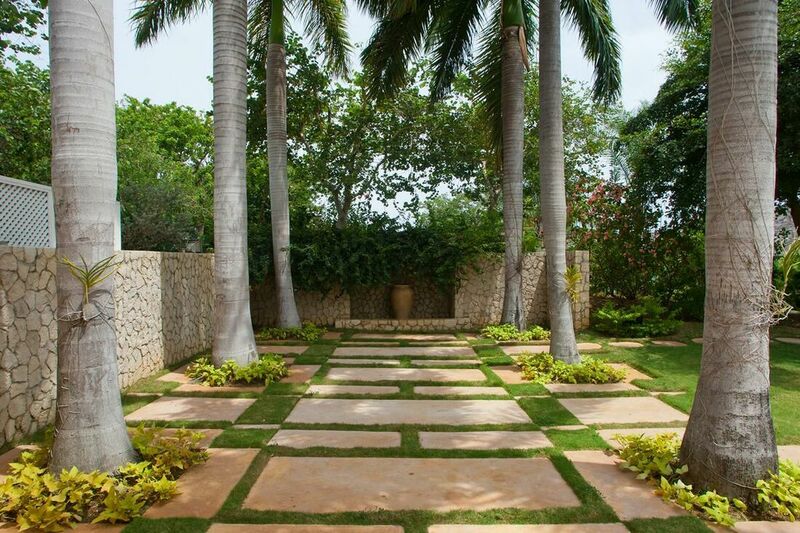 Stately palm trees beautify the luxury villa Jamaica. 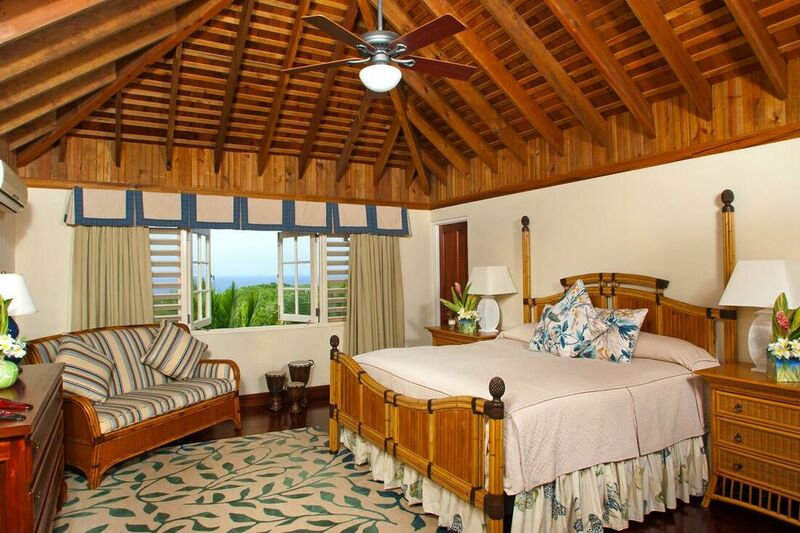 The Master bedroom is a large suite with a glamorous en-suite bathroom located on the main level. A regal mahogany staircase leads up to the second and third bedrooms, each with an en-suite bathroom. 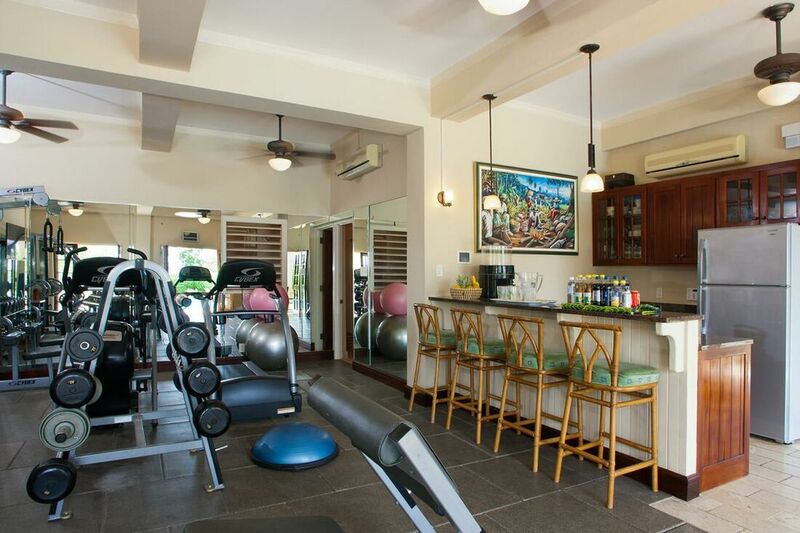 There is a spacious gym, full bathroom with sauna, double shower and steam room, massage table and kitchenette next to the pool terrace. 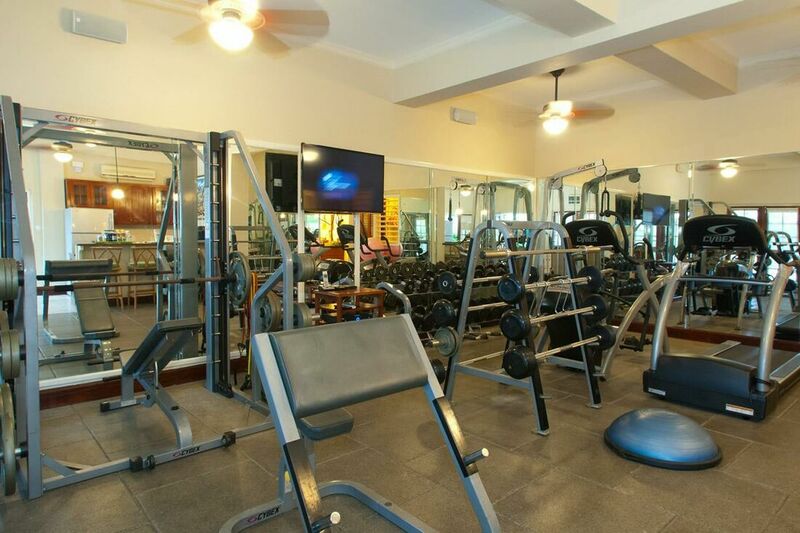 The fully equipped gym has treadmill, bench, elliptical, universal, step-up, weights, power balls and a 42” Samsung SmartTV with DirectTV. 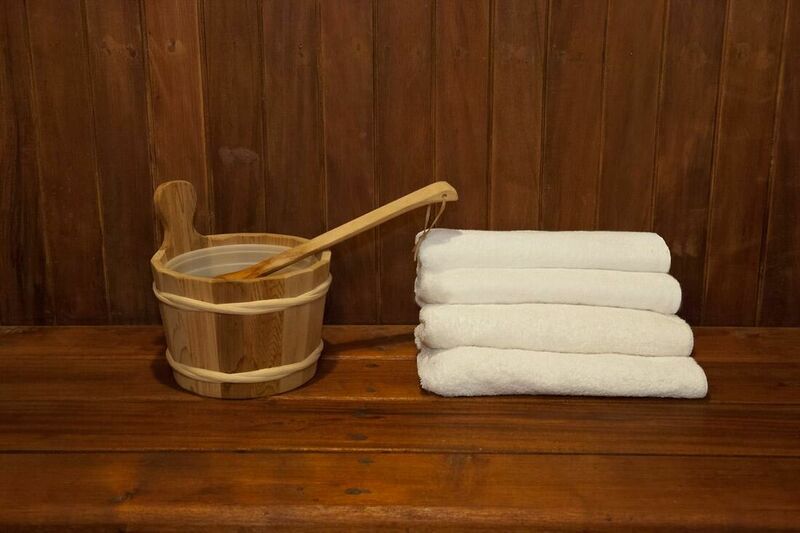 A house masseuse is available on demand at additional service charges. 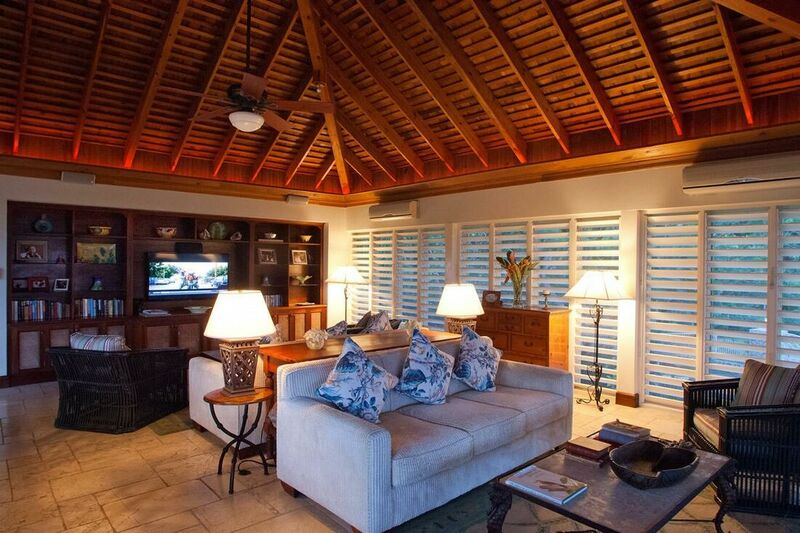 The lovely living areas are located on the main level of Jus’ Paradise Golf Villa and are very comfortable. Having been designed for casual relaxation without any fuss or formality, you will feel right at home in the living room barefoot! Known as the Great Room, the central living room has a 42” Samsung SmartTV and DirectTV for those of you who do not wish to miss their favorite television shows. 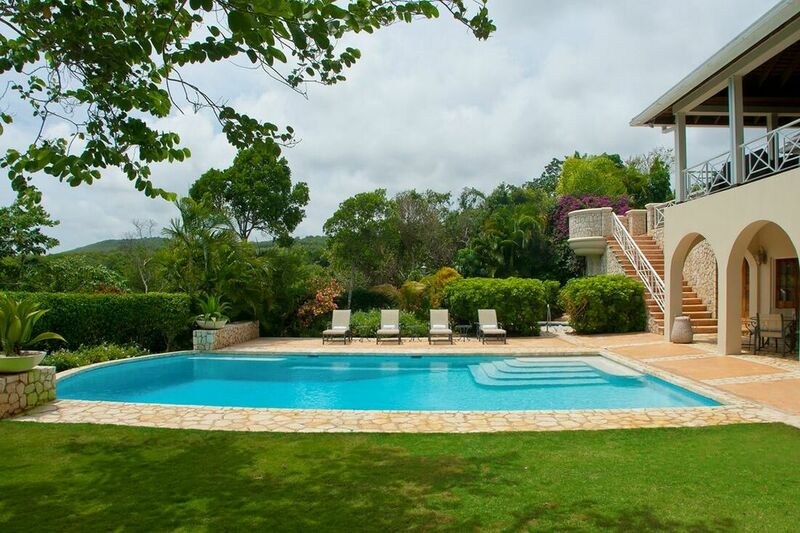 It opens onto a furnished balcony, which offers fabulous views of the lovely landscape! The balcony is furnished for seating and dining. Satellite radio and a 20-speaker sound system is set up all across Jus’ Paradise Golf Villa with individual area controls. There is another smaller sitting room upstairs for more intimate conversations. If you are the sort who has to keep in touch with their office and work a bit through the holiday, we understand. 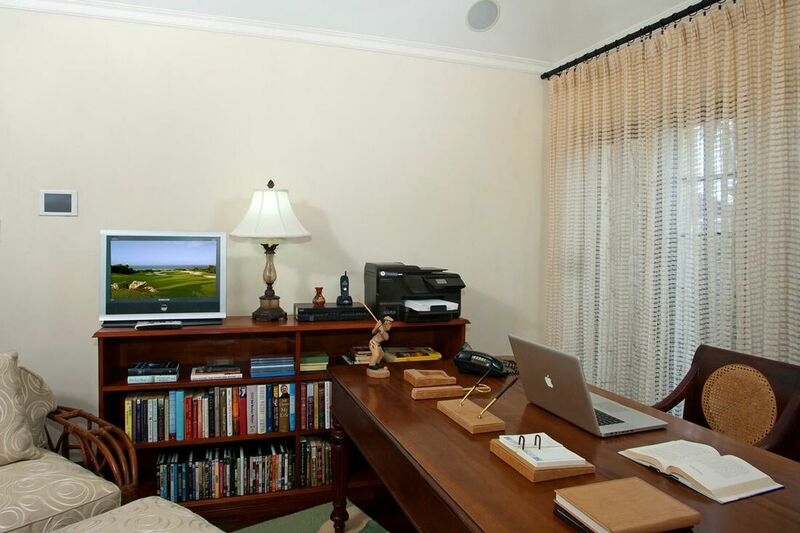 There is a brightly lit, air-conditioned office fully-equipped with an HP printer, laptop, copier and fax machine. 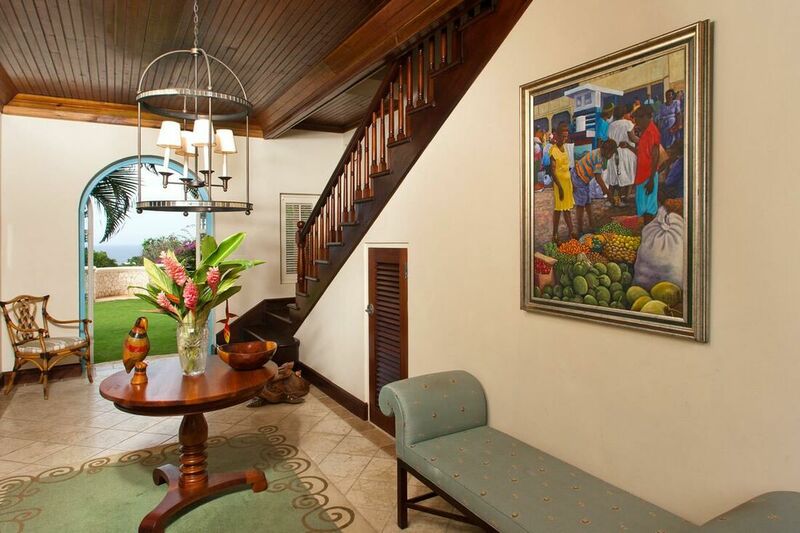 Wi-Fi services are available throughout the villa in Jamaica. The kitchen at Jus’ Paradise Golf Villa is very modern and state-of-the-art with stainless steel and granite. Your meals can be served at your whim and desire at any of the various dining areas. We’ll suggest coffee in bed or on your balcony, and follow that with elaborate breakfasts, lunches and dinners on the airy balcony or in the Great Room. 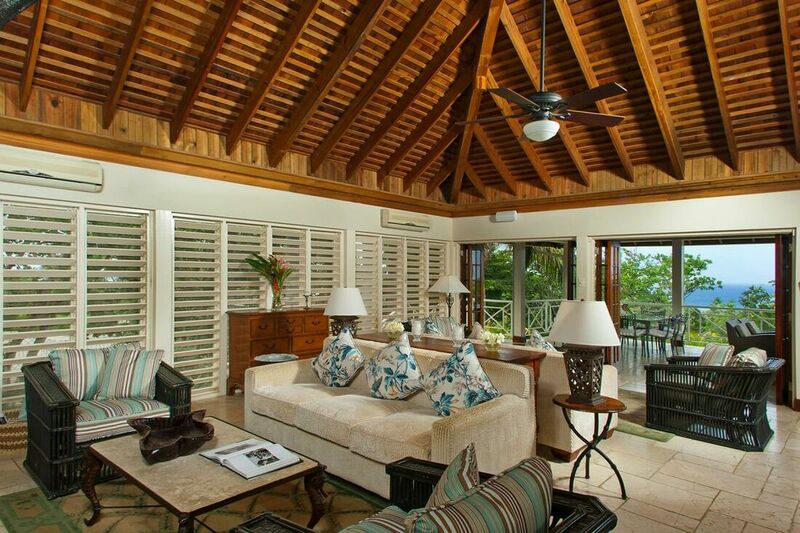 The Great room has three window walls that let the Jamaican breezes from the sea inside. Children can be served dinners early so that their parents may enjoy their all-adult candlelight dinners. 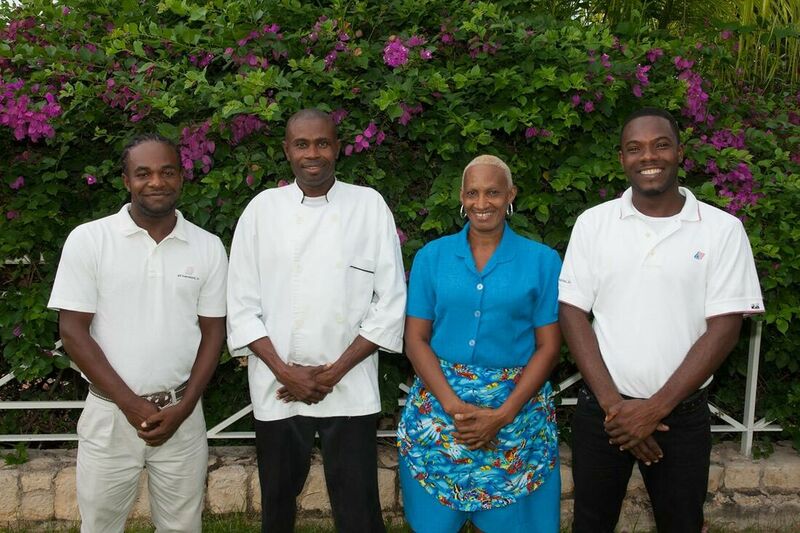 Jus’ Paradise Golf Villa is fully staffed with very dedicated and efficient staff members including the chef, butler, gardener, housekeeper and laundress. The butler, Kemon, has an expertise in making amazing cocktails and hors d’eouvres, particularly his signature health drink, Soursop Smoothie. The very remarkable Chef Linval creates the most appetizing meals, be it grilled tenderloin, coconut snapper, BBQ or Chinese. His desserts are the best ever, particularly his banana flambé. 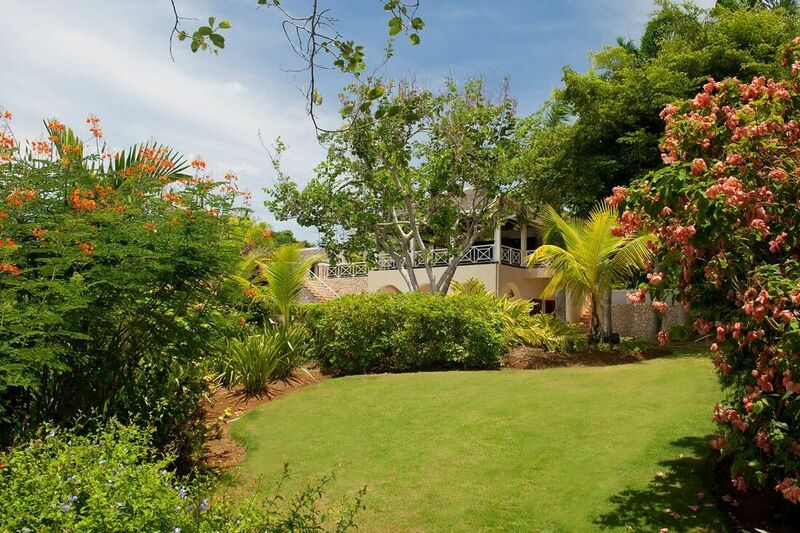 Other specialties you can expect at Jus’ Paradise Golf Villa include traditional Jamaican jerk chicken, lobster, ribs, kabobs and a variety of delicious soups and salads. A back-up generator ensures continued power supply. Excellent security services are available. 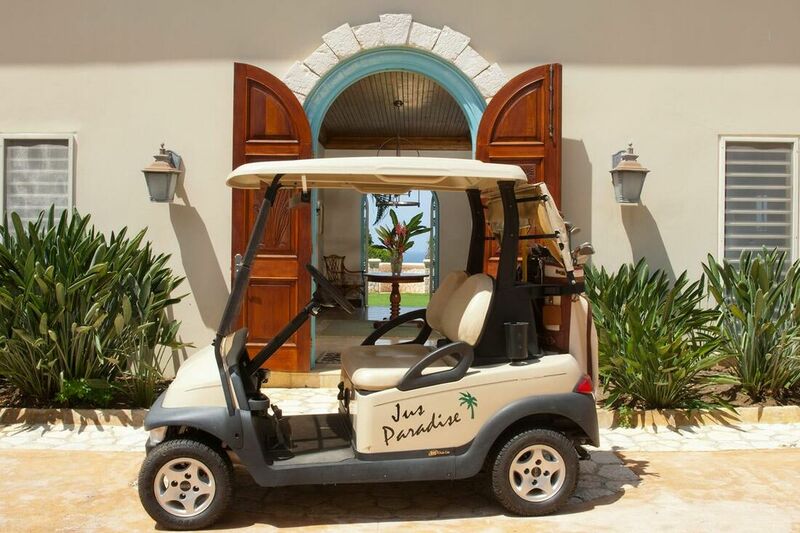 Golfers at Jus’ Paradise Golf Villa can take the two complimentary two-seater golf carts provided by the villa to White Witch or Cinnamon Hill before 10 am or after 4 pm for unreserved golf time. They can also drive down the long fairways or jog on the cart paths within the same timings. 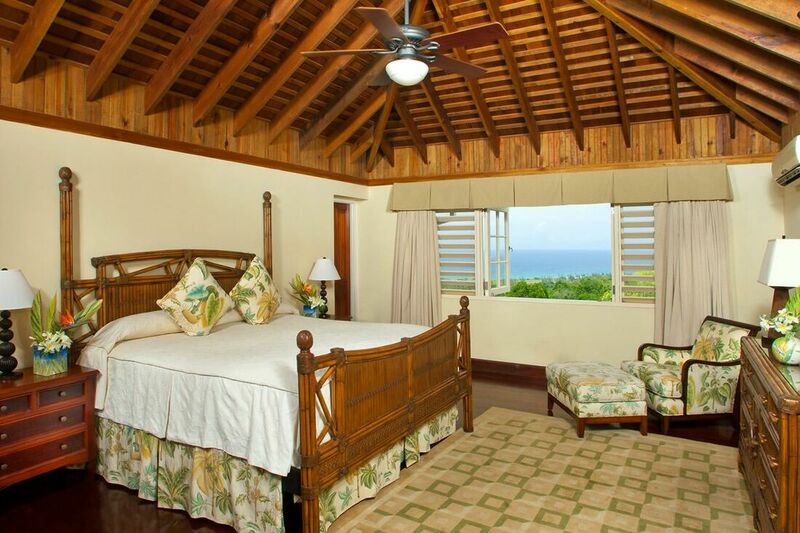 The Master Bedroom Suite at Jus’ Paradise Golf Villa is located on the main level. Rather large at 480 square feet, the bedroom is furnished with a king-sized bed and 42” Samsung SmartTV and DirectTV. 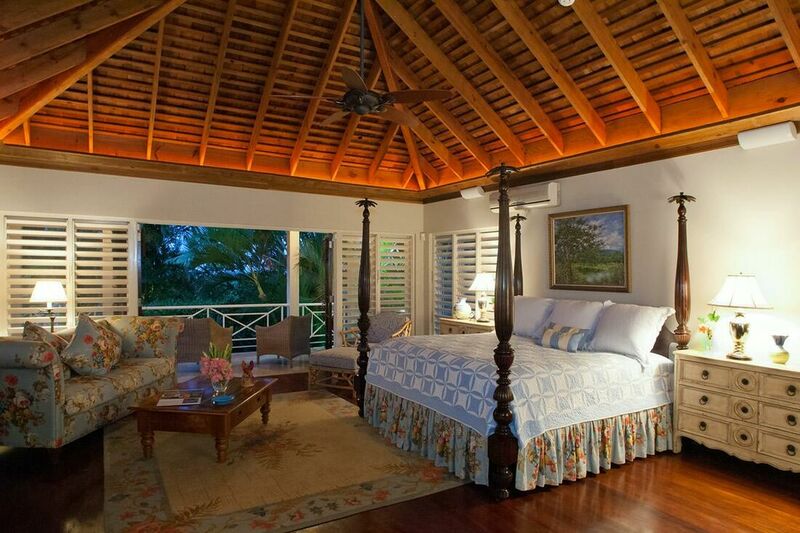 The high ceilings and custom-made four-poster bed give this room an air of grandeur. 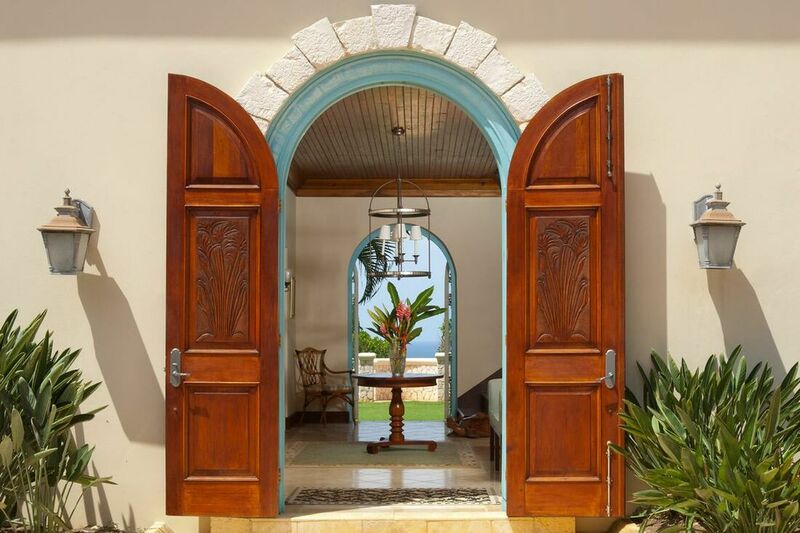 Walk out to the private verandah for a spectacular view through the French doors! The lavish en-suite bathroom has a walk-in shower, double sinks and a Jacuzzi. 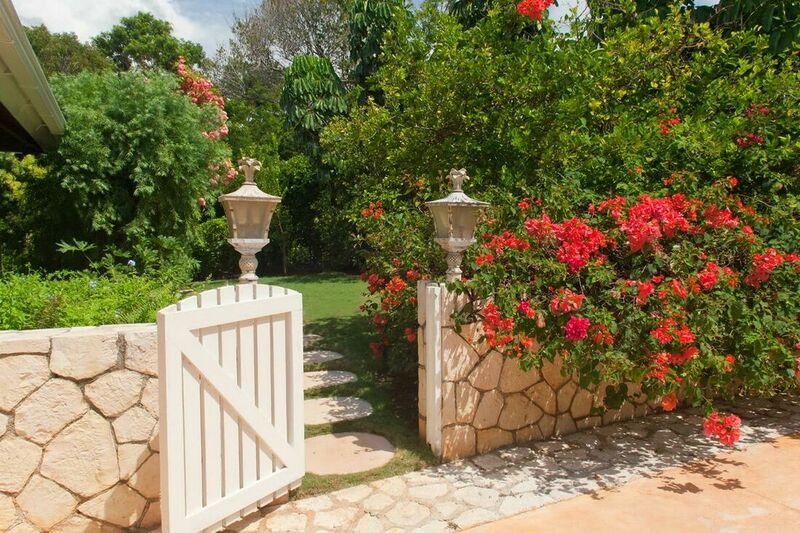 Additionally, there is a garden shower and a second full bathroom with a walk-in shower is also available. The office connects to the master bedroom. The second and third bedrooms are upstairs. The spacious and identical 300 square feet rooms are furnished with king-sized beds. Each bedroom has an en-suite bathroom with a tub and shower combination. Both bedrooms open into the same hallway and can be suitable to for two couples or a family of four. For additional guests, one more twin bed can be placed in either bedroom. The villa also provides two inflatable beds on the guests request at an additional fee. The maximum possible occupancy is 10 persons and has to be approved in advance. 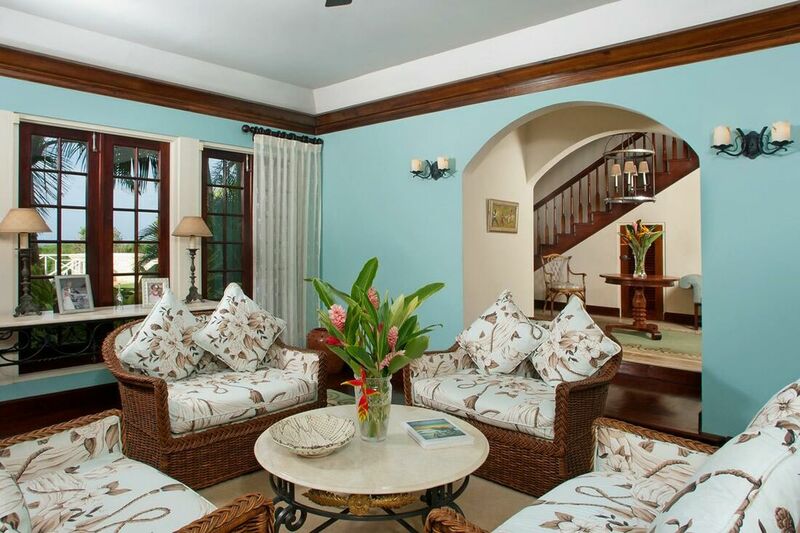 The sister villa, Kenyan Sunset Villa is a short walk from the gate. 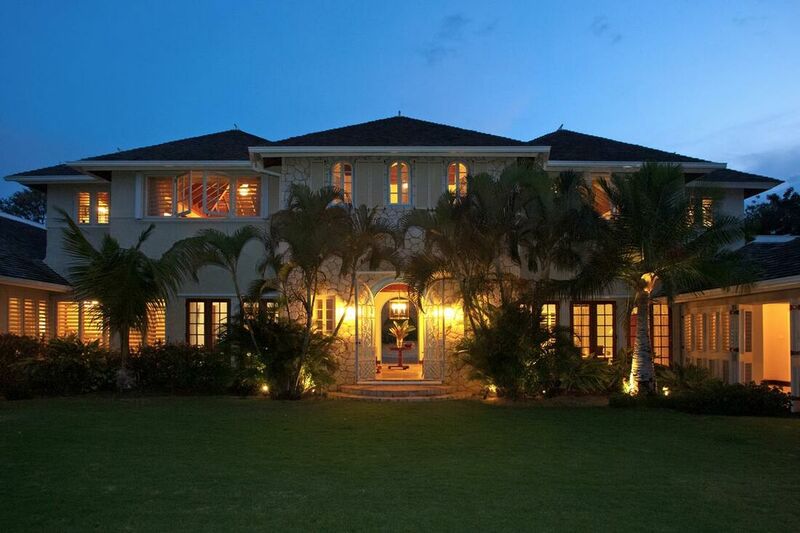 Large families or groups can add five additional bedrooms at this sister villa to Jus’ Paradise Golf Villa for a combination of eight bedrooms in all, ten staff members, two gyms, four golf carts and a movie theater. 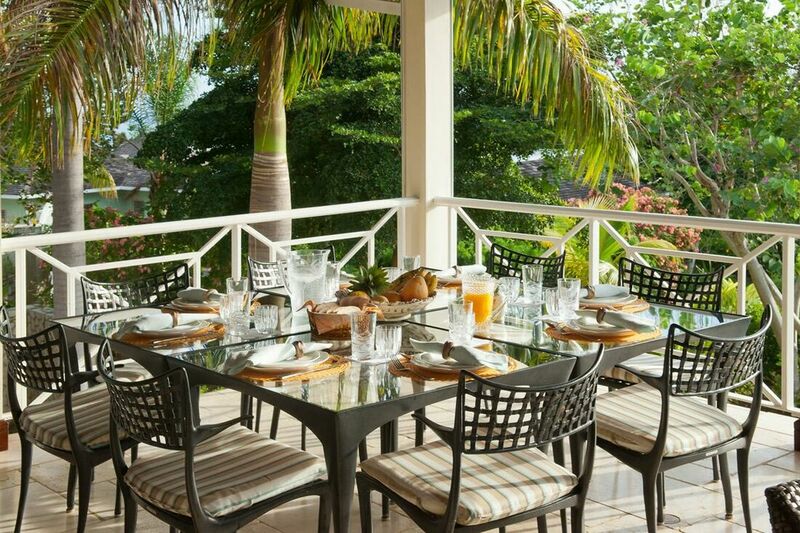 Meals can be served at either villa rental in Jamaica at the request of the guests. For larger groups, add five more bedrooms in sister villa Kenyan Sunset for a combined total of eight bedrooms, 10 staff, two pools, two gyms, two wine coolers, four golf carts, one playground and one movie theater. Staff from both villas will coordinate to serve lunches and dinners to the entire group together if wished. See Kenyan Sunset Golf Villa. -Master bedroom can walk out to the lawn and has adjoining office area.